Proven quality, consistent results for casting gold, silver, brass, bronze - produced to reduce respirable dust in the investing process. Ultra-Vest investment is accepted by jewelry casters as being the most process forgiving product available for casting – saving casters time and money. 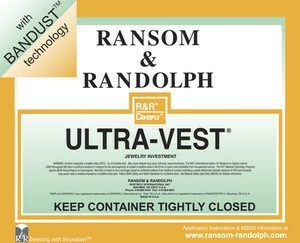 Ultra-Vest investment provides easy quench and easy clean-up, reducing your risk of losing valuable metal.Ultra-Vest investment produces smoother surfaces than other investments, resulting in less finishing.